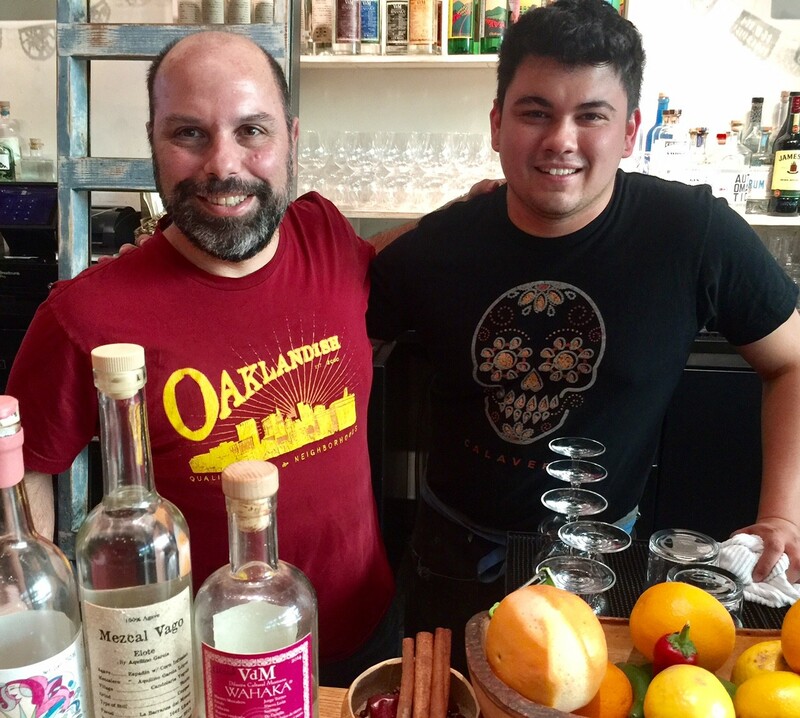 Christ Pastena (left) and a staffer at Calavera in Uptown Oakland. If you're looking to explore something new in the world of alcoholic libations — and why wouldn't you be — then the second-annual Agave Fest Oakland is probably a can't-fail destination. Agave Fest is the brainchild of Chris Pastena, who owns and operates Calavera in Uptown, among other city eateries. About a decade ago, he took a deep dive into the world of mezcal, and embraced, he explained, how the spirit "invokes a sense of place." During a recent mezcal tasting at Calavera, which is hosting Agave Fest this week and through the weekend, we took a mini-tour of mezcal varietals. It's important, as Pastena pointed out, to "think of mezcal more in the world of wine." This is because terroir comes into play in a big way. Specifically, mezcal is made with agave, and so a region's soil, elevation, natural bacteria, water and so on all have an unique impact on the final product. Consider: We first sampled Mezcal Vago, a mezcal distilled through corn, which imparted a aggressively high-octane and smokier character. Very tasty. Next, a mezcal by El Jolgorio, which gave off smoother flavors of pine an juniper, an almost botanical profile, and a bit more experimental. This is a fascinating departure from the first mezcal. And then, to finish, a "Vino De Mezcal" series bottle by Wahaka Mezcal. It's profile stood in stark contrast to the previous tastings, what with its funky, fermented noise and dynamic smokey character. It is a remarkable sipping mezcal. Indeed, all three bottles were completely unique. 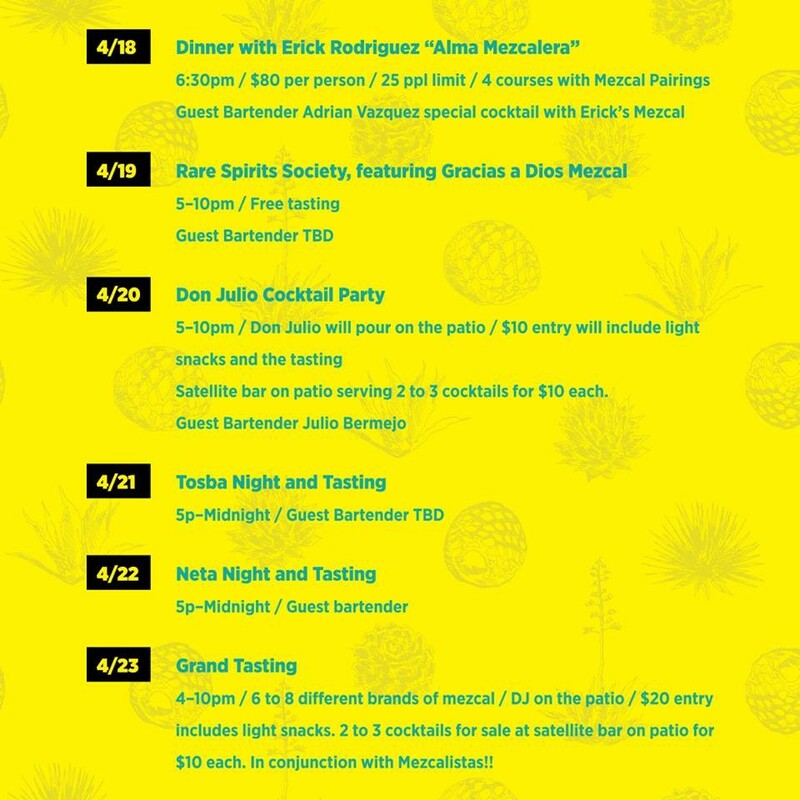 Sunday, April 23: This is Pastena's grand tasting, from 3-10pm, and the very reasonable $20 entry includes small bites and eight different mezcal samplings, plus deejay tunes.